Cheek deformities may involve missing skin from skin cancer removal, fractures of the bone or congenital under-development of bone and soft tissue. Since the cheek is the highlight of the midface region, deformities in this area can be quite noticeable. 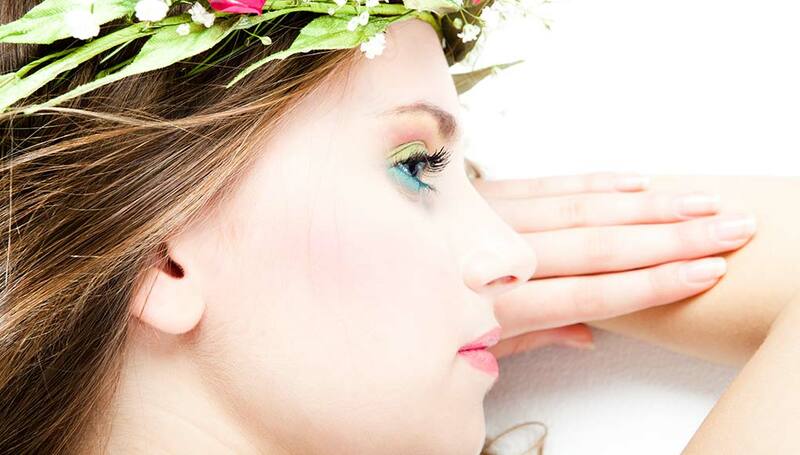 Cheek reconstruction aims to restore the normal skin cover and contour of this prominent facial feature. Repair of skin cancer defects is one of the commonest reasons for cheek reconstruction or another type of face and neck surgery. Skin cancer in this area is usually removed by the Mohs technique. 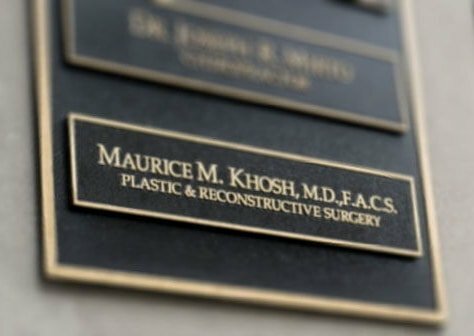 Dr. Khosh is an expert in repair of cheek skin defects after Mohs excision. 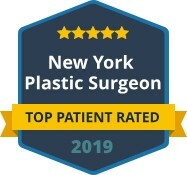 Depending on the location and size of the defect, skin flaps and secondary laser skin treatments can erase any visible signs of the skin cancer or evidence of its removal. Cheek fractures occur as a result of motor vehicle accidents, sport injuries or assault injuries. Cheek fractures may be associated with other facial injuries or fractures. A CT scan is necessary to fully evaluate the extent of bony fractures and plan surgical repair. Repair of cheek fractures is accomplished through hidden incisions inside the mouth or the lower eyelid. Small titanium implants are used to reposition and stabilize the cheek fracture. Congenital abnormalities of the cheek are rare. 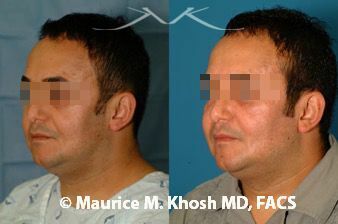 Dr. Khosh prefers using fat grafting for repair of congenital under development of the cheek (hemi-facial microsomia). Congenital tumors such as vascular malformations or hemangiomas may require laser treatments, surgical excision and flap repair, or a combination of both. 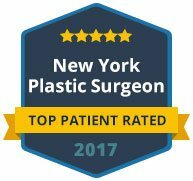 For more information on cheek reconstruction or to schedule a private consultation with Dr. Khosh, contact our office today. Please view the case studies listed below for examples of cheek reconstruction for various deformities including skin defects, cheekbone fractures, or congenital deformities. This 35 year-old-female has Mohs excision of a basal cell cancer from the middle of her cheek, resulting in a 2.5 x 1.5 cm loss of skin. Repair under local anesthesia resulted in an imperceptible scar. 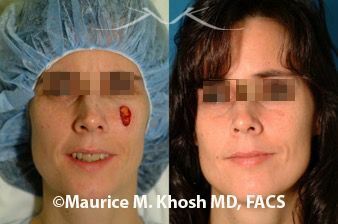 This 38 year-old-female has had multiple basal cell cancers of the face. 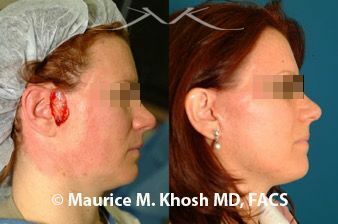 Removal of a recurrent cancer resulted in a 5.5 x 3.5 skin loss in front of the ear. 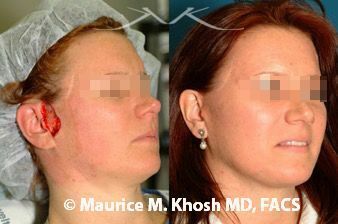 A facelift type flap was used to move the cheek skin back and hide the resultant scar. 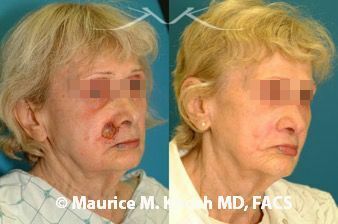 This 66 year-old-female had a basal cell cancer removed by Mohs surgery. There was a 1.75 cm skin defect at the junction of the cheek and upper lip. An island pedicle flap was used for repair. The scar lines are well hidden in the natural creases of the face. This 38 year-old-male was born with congenital under development of the left side of his face. Ten years ago, a cheek implant was placed in hopes of improving the facial appearance. 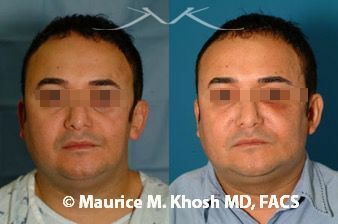 The entire left side of the face was augmented with two sessions of fat grafting. 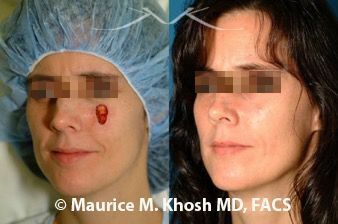 This 57 year-old-female had a basal cell cancer removed from the upper-outer cheek near her temple. She had a large circular defect measuring 3.5 cm in diameter. This was repaired with a cheek advancement flap with an imperceptible scar. 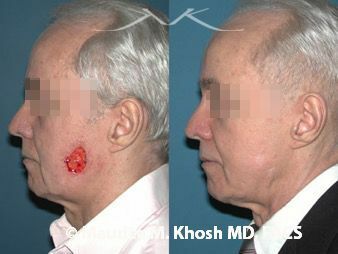 This is a 56 year-old-male after removal of basal cell cancer in the lower-outer part of cheek. This resulted in a 4.0 x 3.5 cm defect of the skin. The area was repaired with a rhombic transposition flap. What kind of anesthesia is used for cheek repair? Repair of small and medium sized cheek skin cancer defects and cheek augmentation with fat transfer can be performed under local anesthesia. Surgical repair of larger cheek defects and repair of cheek fractures requires general anesthesia in an operating suite. When can I return to work following cheek reconstruction? The swelling and bruising that follows surgical repair of cheek skin cancer defects or cheek fractures is mostly resolved after two weeks. Most patients can return to work at that time. When are the stitches removed following cheek reconstruction? In most cases, sutures are removed after 5 to 7 days. What is a cheek advancement flap? Advancement flaps are quite useful in repair of cheek defects. 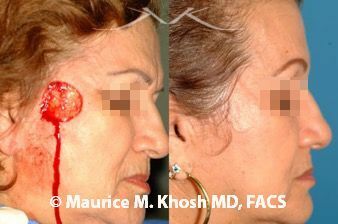 The skin from the remaining, intact cheek is advanced to the site of the defect, and the incisions are closed. This requires additional incisions on the face, but such incisions heal quite well. Reconstructive surgery for cheek defects is aimed at restoring the face. In skin cancer repair, related procedures may entail secondary surgical treatments to enhance the cheek appearnce or laser treatments to camouflage scars. 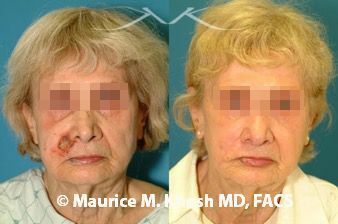 In facial fracture repair, related procedure may include fat transfer or facial filler injections to improve facial contours.